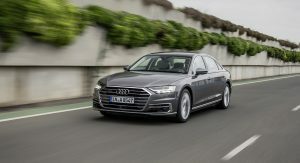 Audi hasn’t said much about the 2019 A8 since they staged the North American debut of the model at the Los Angeles Auto Show last year. That’s changing today as the automaker was quietly released a configurator for the redesigned flagship. Set to go on sale late this year, the 2019 A8 will be priced from $83,800. 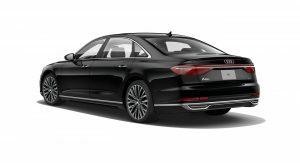 That means the model will be $150 more expensive than the BMW 740i and $6,100 less than the Mercedes S450. 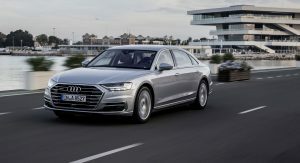 Despite the reasonable pricing, the A8 comes nicely equipped with LED lighting units and 19-inch alloy wheels. 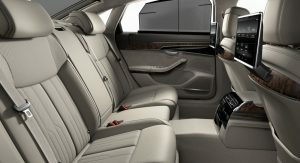 Drivers will also find a luxurious cabin with Valetta leather upholstery and three choices of wood trim. 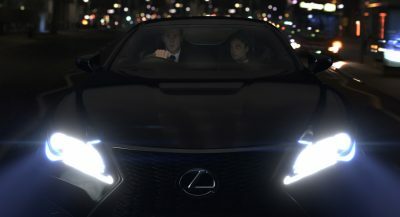 The car also features a panoramic sunroof, a four-zone automatic climate control system and a rearview camera. One of the car’s most defining features is its three screen interior layout. 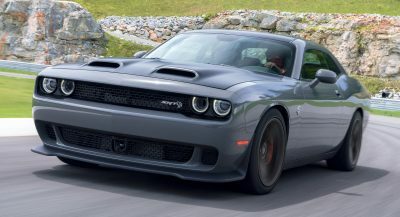 It consists of a 12.3-inch digital instrument cluster, a 10.3-inch infotainment system and an 8.6-inch display for climate control and convenience features. 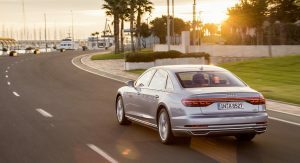 While the A8 comes well equipped in base form, customers will be able to order a dizzying array of options. 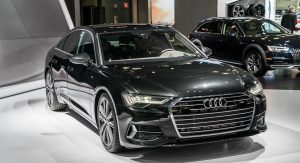 Starting with the exterior, Audi offers a $3,400 Lighting package which adds HD Matrix LED headlights and OLED taillights. 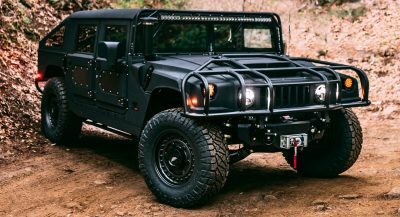 Customers can also order 20-inch wheels for an additional $1,200. 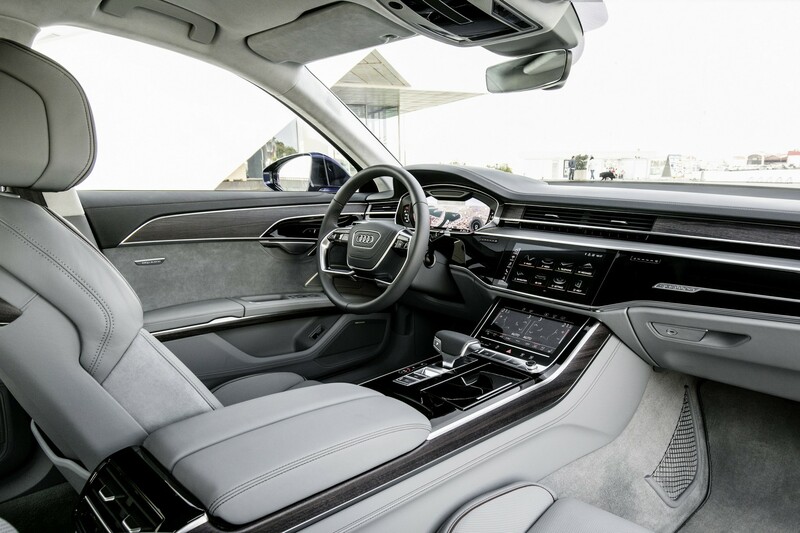 Of course, luxury sedans are all about the interior and the A8 doesn’t disappoint as the model can be equipped with an Executive Rear Seat Comfort package for $7,550. The package is a bit pricey, but it includes two individual rear seats with power adjustment and standard heating. 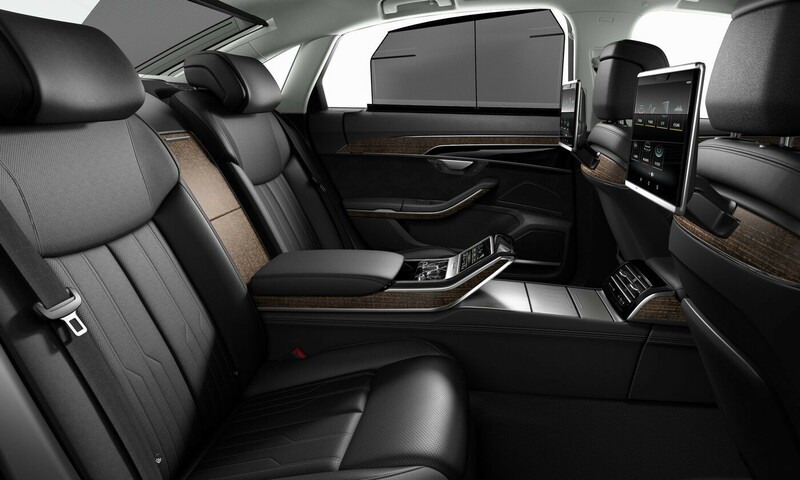 The seats are separated by a full-length center console which houses retractable tray tables. If that wasn’t impressive enough, the package also includes a touchscreen “smart remote control” and a passenger side relaxation seat with a footrest and a foot massager. 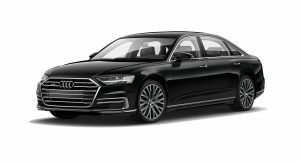 Buyers who need to stick with the five-seat layout aren’t completely out of luck as Audi will also offer a Rear Seat Comfort package for $3,500. It includes heated, ventilated and massaging seats as well as rear power lumbar support. The package also has the smart remote control and the ability to adjust the front passenger seat from the rear of the car. 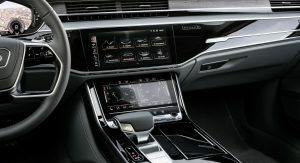 Sticking with rear passenger options, the $3,250 Rear Seat Connectivity package includes two rear displays, a DVD changer and an Audi music interface system. 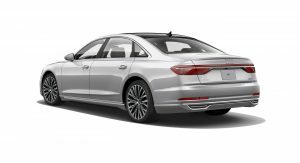 Another notable option is the $4,250 Luxury package which adds ambient interior lighting, Valcona leather upholstery and an Alcantara headliner. The package also includes aluminum switchgear, an air ionizer and a fragrance diffuser. 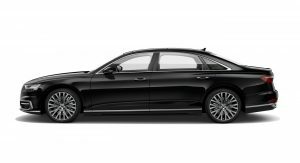 The $4,150 Executive package goes even further as it includes dual-pane acoustic glass, a head-up display, a heated steering wheel and 22-way power front seats with heating, ventilation and massage functions. The package also adds an assortment of driver assistance systems including rear cross traffic alert and side assist with exit warning. 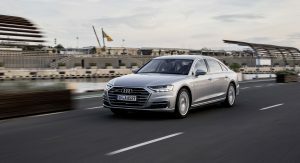 Drivers who want more technology can order the $2,750 Driver Assistance package which adds adaptive cruise assist, traffic jam assist, turn assist and predictive efficiency assist. Other highlights include intersection assist, active lane assist and traffic sign recognition technology. 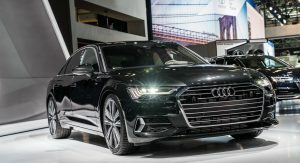 Among the other options are dynamic all-wheel steering ($1,950), night vision assist with pedestrian detection ($2,300) and a Bang & Olufsen premium audio system ($5,900). Power is provided exclusively by a turbocharged 3.0-liter V6 TFSI engine that produces 335 hp (250 kW / 340 PS) and 369 lb-ft (500 Nm) of torque. 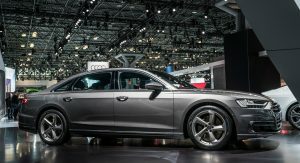 It is connected to an eight-speed automatic transmission and a standard quattro all-wheel drive system. This setup enables the luxury sedan to accelerate from 0-60 mph (0-96 km/h) in 5.6 seconds before hitting a top speed of 130 mph (209 km/h). 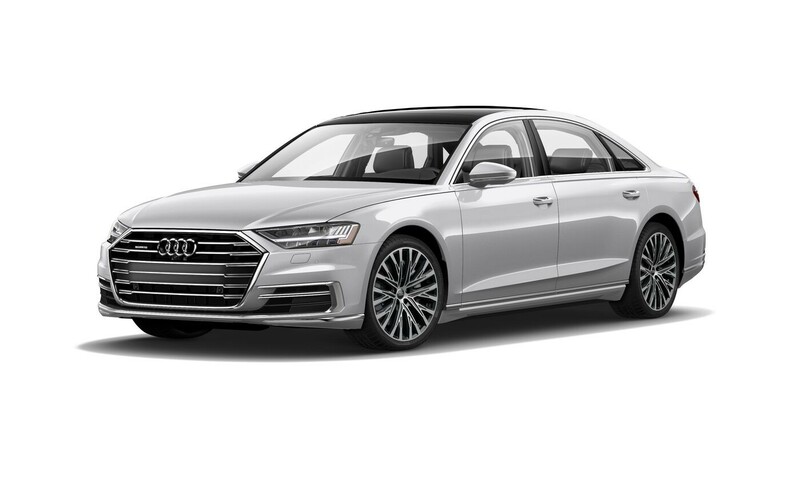 You can build your own A8 by using the configurator located here. You need better styling for luxory segment! You need better spelling for english! No I don’t! I write as a wish and not asking you! You need better sense of humor for internet! You need better seriousity for internet! All Audis have looked identical since the mid 2000’s, don’t be too harsh. Some see that as a good thing though. Take this scenario and line up four generations worth of A8’s, S Class, and 7 Series. 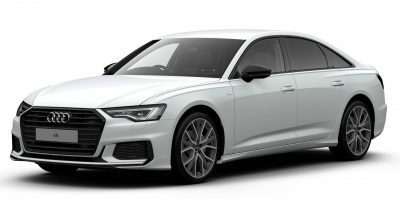 You’ll notice a more dramatic change in the Mercedes and BMW’s over the generations of course in comparison to the Audi, but those Audi’s look newer longer. For that matter look at the Cayenne, and 911, the Bentley GT, even the RR Phantom. The evolutionary design philosophy works as a double edged sword in a good way. Keeping the older vehicles looking fresh but the newer ones always a step ahead. Maybe I haven’t bothered checking it in real. Interior is ok.
Looks like a fat Jetta with a shiny black plastic dashboard.